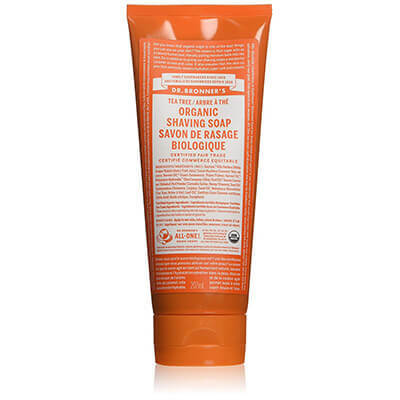 Have you been stuck searching for the best organic shaving products for your shaving needs? Have you been hearing about the powerful benefits of using organic shaving products but have not learned enough to make the switch for yourself? If so, you’ve made it to the right place! Here, we will help you on your journey to finding the best organic shaving products for your personal needs. No matter what exactly you are looking for, we will be able to help you by giving you everything you need to know in this one-stop-shop guide. 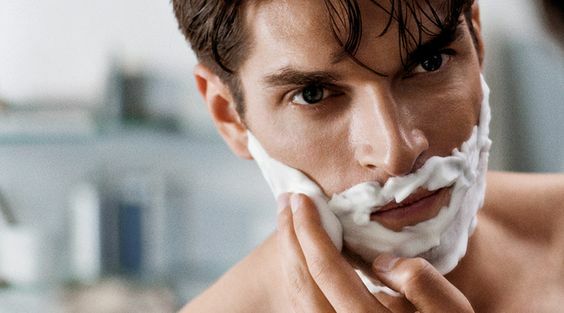 Let’s start by taking a look at the best-selling organic shaving products this month. Made with premium anti-inflammatory natural and organic ingredients. Includes aloe, DMAE, MSM, Plant Stem Cells, Vitamin C, hyaluronic acid, protein peptides, and caffeine. 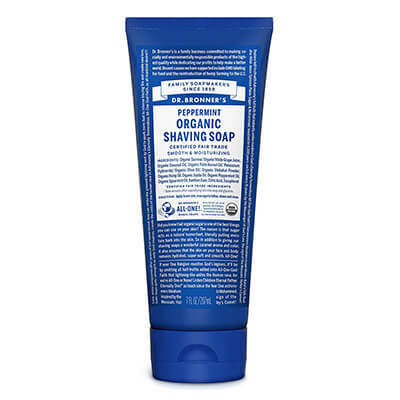 Dr. Bronner’s Peppermint Organic Shaving Soap is certified organic and vegan by the USDA National Organic Program and Vegan Action. This natural product is a smooth and luxurious soap that includes no synthetic detergents or preservatives and none of the ingredients are genetically modified. The organic ingredients of the soap combine together with a Pure-Castile Liquid Soap base which combines together to create a rich and emollient lather, creating a moisturizing after feel as well. The shikakai ingredients originate from small trees in South Asia and India and offer gentle conditioning cleansing for skin and hair both. 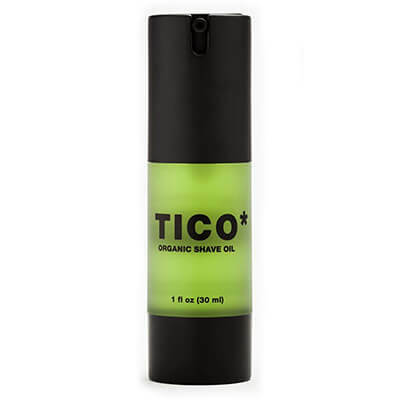 TICO* Shave Oil is a four-in-one product as it offers a pre-shave, shave oil, aftershave, and moisturizer all together in one fluid product. One single bottle is enough to provide for more than 125 shaves and the size of the bottle is small enough to be TSA travel-friendly. 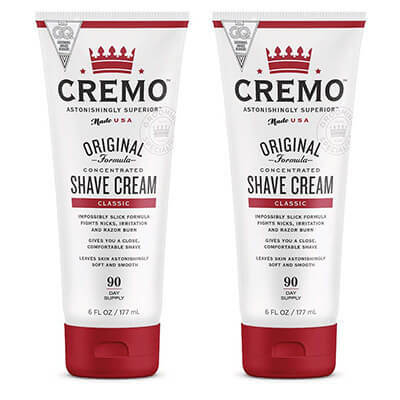 Featuring only USDA Certified Organic ingredients, this shaving product gives you a close and more smooth shave with less pain and irritation than what you would get from a synthetic shaving product. Dr. Bronner’s Organic Shaving Soap Gel Tea Tree is a natural shaving soap gel that provides ultimate comfort and smoothness to your entire skin. This product provides ultimate hair lift and wetting to empower you with the ultimate shave. Dr. Bronner’s Organic Shaving Soap Gel Tea Tree is certified organic through the National Organic Program. The soap gel includes organic shikakai which comes from seed pods of small South Asian Acacia Concinna trees. The product’s moisturizing glide is provided with the grape juice and organic sucrose it’s extracted in. 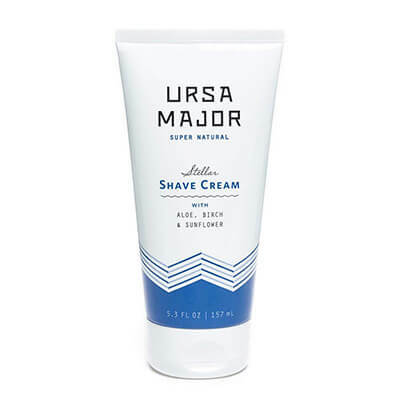 Ursa Major Stellar Shave Cream is a highly concentrated shave cream that is non-lathering. This product minimizes potential skin shaving nicks by actively nourishing skin with the natural healing and calming balm. This product also offers an unforgettable post-shave feeling that is free of soap. Plus, the aroma alone will keep you coming back to this shave cream time and time again. 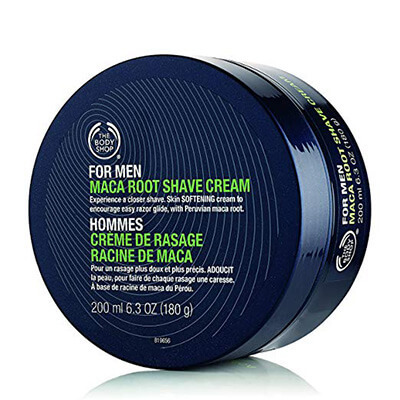 The Body Shop For Men Maca Root Shave Cream Regular works to help you create the ultimate shave thanks to the skin-softening cream which protects your skin from harmful cuts, irritation, and shaving nicks. The organic Peruvian maca root along with the shave cream’s natural creative energize ingredient combines with the healing properties of the cream to improve your skin’s natural vitality. Plus, Community Trade Brazil nut oil, Community Trade sesame oil, and aloe vera work to moisturize, soften, soothe, and hydrate sensitive skin all at once. 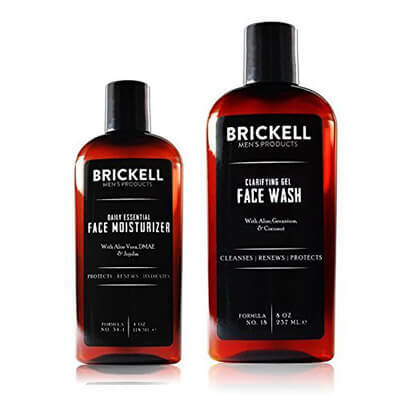 Brickell Men’s Daily Essential Face Care Routine I is perfect for all skin types. 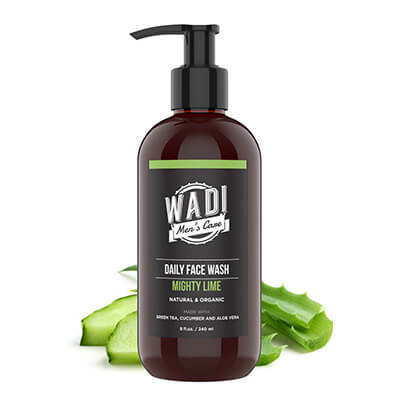 This product utilizes the benefits of organic eucalyptus and agave to create an all-in-one dual toner and moisturizer. This product naturally offers healing properties to make for a relaxing and comforting post-shave experience. Plus, these ingredients combine to protect against environmental pollutants. 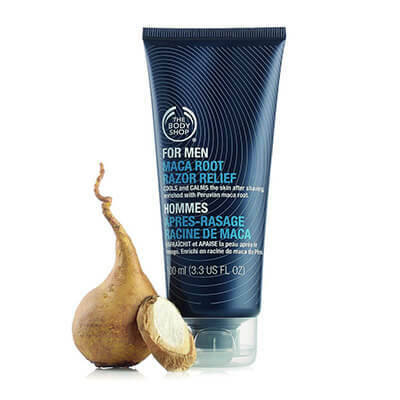 Last but not least, The Body Shop For Men Maca Root Razor Relief cools, calms, and soothes freshly shaved skin to prevent and protect from skin irritation and shaving burns thanks to the silky-smooth and lightweight formula that makes this product the great product it is. Your skin will be feeling energized and rejuvenated with the Peruvian maca root that also improves and boosts skin vitality. Boswellia extract keeps your skin feeling calm once your shaving is complete and even throughout the recovery period afterward. 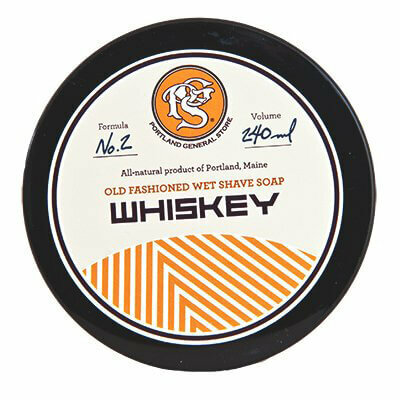 Whiskey Wet Shave Soap is a naturally rich lathering shave soap with ingredients blended to create one of the most effective and powerful clays for skin healing. Made with bentonite clay, this blend, which is also referred to as Montmorillonite, pulls toxins right off the skin to make your skin look and feel good as new. Also included in the ingredients of this product are glycerin apple cider, beeswax, and castor, coconut, olive, and palm oils. The cedar wood base note brings a refreshing and relaxing scent to your overall shave experience. Herban Cowboy Dusk Premium Shave Cream is a premium dusk shave cream that is conditioning for the skin and soothing for the skin while also being non-lathering. This product is 100% vegan and made in the United States with natural and organic lavender, menthol, and aloe. These ingredients combine to cool and condition the skin, creating a beautifully gentle shave. The natural vegan ingredients not only improve how you feel, but they improve your skin’s overall health as well. 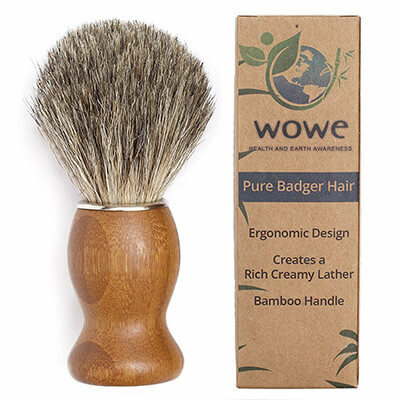 100% Pure Badger Hair Shaving Brush with Natural Bamboo Handle is ideal for the shaving aficionado and enthusiast. Made purely from 100% badger bristles, this shaving brush also includes a smooth and natural bamboo handle to create a sleek and modern look. Additionally, bamboo itself is naturally environmentally friendly, so water will repel, thus protecting your brush from splintering and therefore allowing it to last longer. The natural brush is able to create a rich lather to gently lift your beard and exfoliate your skin, bringing life to your skin and beard together. You likely know and understand the convenience of regular everyday shaving products, those shaving products that are made with synthetic and artificial chemicals. Yes, products like these are often less expensive and more readily available to purchase, but have you noticed how your skin feels with these products? Your skin probably feels “okay,” but definitely not as good and prime as it could feel. That’s one of the best benefits of using organic shaving products: they work and they make you feel good. You will feel fresh and brand new as you’ve never quite felt before. It’s kinda tricky to explain the difference between organic and artificial shaving products without experiencing the difference between them. That’s where the key is, in the feeling of the high-quality freshness and rejuvenation offered by organic shaving products. What makes organic shaving products as great as they are is the ingredients used to make them. As you likely guessed, they are made with natural ingredients that our bodies naturally long for and crave. However, over time and with the use of synthetic chemicals, our bodies have not gotten these ingredients that they need. When you will start using the organic shaving products, you will truly instantly see how good they feel and how much better these products are than what you have traditionally used in the past. No matter what products you are looking for, keep an eye out for these ingredients. If what you are looking for has any of these, you know you have a great product. DO you have sensitive skin, traditionally dry or oily skin? Are you working on growing some awesome mustache or a nice beard (or already have one)? Are working on a new hairdo, want to protect yourself from the aging process? Or simply want to take better care of your skin and hair (so, guys, this essentially means all of us)? Then you will benefit from organic shaving products. Now that we have a better understanding of organic shaving products and their benefits, let’s take a look at 10 of the best products that are out there for your face & body. While natural and organic shaving products are generally a touch more expensive than other products that are available. The quality and the effect of these products are profound in offering you the greatest results for your body’s needs. Any and all of these natural organic shaving products will help you get the greatest shave of your life. Give them a try today and let us know which ones you like the most!